Overjoyed - FACT Magazine: Music News, New Music. 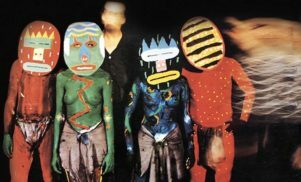 In a pre-internet era in which music magazines felt like a lifeline, the patronage of Nirvana had the effect of catapulting minor indie-rock bands right into the heart of the mainstream. Probably, they’re the reason why Half Japanese are not just in a position to put out records to some fanfare two decades later, but are regarded as elder statesmen of sorts. Overjoyed – Jad and his brother David’s first long-player in 13 years – updates their formula in some fairly stark ways. By their standards, it’s a relatively hi-fi affair, with John Dieterich of Deerhoof on production, and Jad – who once noted “the only chord I know is the one that connects the guitar to the amp” – having appeared to have made at least a cursory attempt at tuning up, meaning that moments such as the lilting Hawaiian guitar twang of “Brave Enough” feel genuinely, formally pretty. 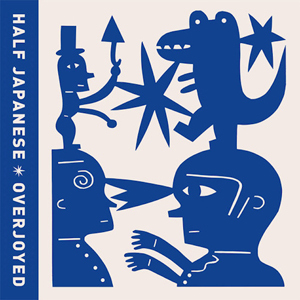 Half Japanese’s essential oddness, though, is not the sort of thing that can be masked with a bit of studio polish. Jad still has that goofy, Garth-from-Wayne’s-World delivery, and whereas once his songs focused on classic geek concerns – monsters, sci-fi, virginal love songs – here he’s in the role of a sort of motivational teacher, squealing “Be the best you could possibly be/Happiness is victory!” on the gawky AC/DC squall of “It Its Pull” and promising “When Jad Fair tells you you are great/Jad Fair ain’t no liar/You are first rate” on “We Are Sure”, which also features a lengthy lyrical digression on kittens, birds and pear trees. By and large, Overjoyed works when it rocks – the snarling chugga-chugga of “Do It Nation”, the nursery-rhyme feedback shredding of “Overjoyed And Thankful” – and falls a little flat when it doesn’t. In one sense, it’s not so much the songs as the presentation that’s the problem. The naïf melodica wanderings of “Tiger Eyes” might work a charm with a bit more scuzz and shamble, but presented crystal clear, it’s as awkward as an unwanted romantic proposition. Shame, because we’re living in an era where freaky outsiderdom and cassette-fi recording are admired like never before, and it feels like Overjoyed might have just missed its chance to score.